Let me introduce myself. My name is Geyser, I am a 25-year old Icelandic Horse. I have seen a lot in my 25 years, but nothing has been as wonderful as the job I have been asked to do at Emerald Hollow Therapeutic Riding Center. I want you to take a minute to think about something; when you woke up this morning did you roll over? Put your feet on the ground and stand up? Walk to the bathroom? Get dressed? Maybe you drove yourself to the local coffee shop for your favorite cup of coffee? Now imagine what it would be like if you couldn’t do any of those things. On Wednesday afternoons, I get to spend time with a young woman who cannot take any of these things for granted, Kacey. She cannot walk and uses a wheel chair to go everywhere. She cannot talk, and cannot see well. Her mornings are much different from yours, but that does not stop her from smiling and engaging in all life has to offer. I look for her white van cresting the hill, always early and eager with anticipation. The volunteers have me outfitted in a small western saddle that supports Kacey as much as possible, and allows her to support herself on the raised horn on its front. Once the van has been parked I head to its door to greet Kacey, as soon as I can, with a gentle nuzzle on her hand. We move together to the specially designed mounting ramp and Kacey puts all her trust in me and the people helping her as they lift her smoothly onto my back. I stand as still as I can. Kacey uses her eye blinks to signal me to “walk on” and “whoa”; two blinks for “walk on” and one for “whoa”. Without the support of her wheelchair, Kacey has to work very hard to use her core muscles to sit up. It’s my responsibility to keep Kacey safe, so I walk carefully, placing each of my four feet, one in front of the other, as we travel around the farm and up and down hills that challenge Kacey’s balance. In those 30 minutes with me, Kacey forgets that her mornings are different than yours. She beams from ear to ear with an infectious smile and has us all belly laughing with her incredible sense of humor. Her joy is contagious. It is a privilege to be Kacey’s legs and take her places that her wheelchair cannot. Kacey is just one of the over 70 individuals with special needs, including 12 veterans, that I and four of my other equine friends have given the gifts of joy, courage and strength to this year. We need your help to keep our costs affordable for all of those in need and to care for me and the four other special horses. 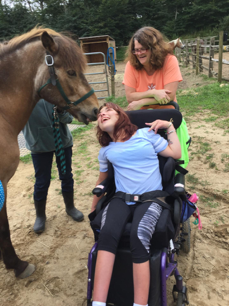 Emerald Hollow Therapeutic Riding Center works hard to keep its overhead very low, allowing 81% of every dollar to go directly to service delivery and horse care. When you wake up and start your day tomorrow, remember all those things we take for granted and consider a donation to be part of bringing the gifts of strength, courage and joy to those with special needs.